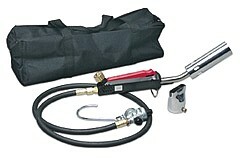 PRODUCT: Sievert PNS-4 Hot-Air Torch Detail Kit for Peel-N-Stick / PVC Roofing, Cable Work, Plastic Membrane Welding. Uses disposable propane cylinders. Price/Kit. Ideal quick repairs and small detail work on peel/stick roofing membranes, cables and other fine work. Enables repairs without a direct open flame. Connects to standard disposable propane gas cylinders, not supplied. Sievert # 3334 Replacement 38MM Flameless 6100 BTU / 1200F Hot-Air Burner. Commonly used for Single Ply. Price/Each. SIEVERT # 3350 DETAIL BURNER, 40 MM, STAINLESS STEEL BURNER. FIT PNS-4., PROMATIC AND OTHER SIEVERT TORCHES. PRICE/EACH. SIEVERT #3358 32x15MM FLAMELESS HOT-AIR BURNER. FITS PNS-4 TORCH. PRICE/EACH. SIEVERT # 3359-90 FLAMELESS HOT-AIR EXTRA SMALL BURNER FOR FINE CABLE HEAT-SHRINK WORK. FITS PROMATIC TORCH HANDLES. PRICE/EACH.